One of my photography goals for 2019 is to take more and better pictures of people. I’m still working on that, and you’ll see more of my portrait photography soon. Sometime in the last year, however, I started noticing other people photographing at the same time as me. We all carry these really awesome cameras with us every moment of the day - our cell phones. Sure, there’s the negative aspect - the “selfie generation” and the fact that we’re all glued to our devices 24/7. Setting that aside though, I think it’s cool. I enjoy photography and I like that others value it too, even if it’s just snapping a quick selfie. So now, any time I am taking pictures and I see someone else also taking pictures, I photograph them! Gabriela and I have walked around the Design District in Miami a few times now. There is some really beautiful architecture, and here she frames up a shot of it. This is a pretty classic location in Melbourne, Florida. The pier is used mostly by fishermen, but on any given day at sunset there are people out enjoying the view. This was a particularly nice one, and this man had the spot staked out and was taking a time lapse with his camera. This is (potentially was, I heard it closed down) a famous plane watching spot in the heart of Taipei, Taiwan. It’s right by the downtown airport and planes fly low overhead and then land on the runway, right in front of you. My friends Jay and Gi taking a selfie at Sunset Cliffs in San Diego. This night and location were spectacular for photos. Gabriela and her friend Maria smile for a selfie in Coral Gables. This spot with the umbrellas had no shortage of people taking pictures! My friend Kalun snapping a photo of the golden light reflecting off of the city of Sedona, Arizona. We went to this spot at sunset and there was a giant crowd, complete with a tour bus. Everyone was having a good time though, so we stayed, mingled, and tried to find our own unique angles. 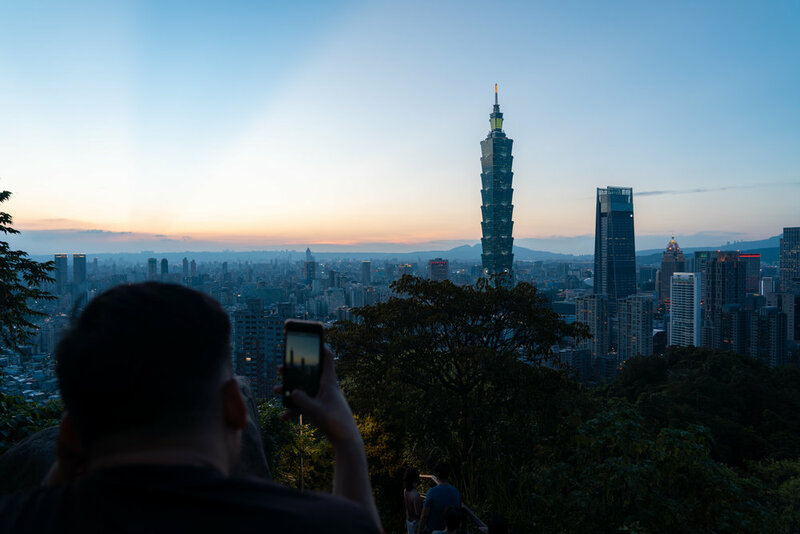 This picture was taken from Elephant Mountain, overlooking the city of Taipei in Taiwan. It’s a popular spot for many reasons. It’s a good exercise trail, leads to a temple, and also has this really nice view. I’ve been here a number of times, but it has always been cloudy and rainy. Finally on this night I got the weather I had been hoping for. Especially on nice days it’s a popular tourist spot, and I found myself talking to and photographing with people from all around the world. I believe the guy in this picture was visiting from Singapore. I wasn’t the only one to get in on the action! This was a trip into Tokyo with one of the other pilots at my airline. We were photographing in Shinjuku and I turned around to find him taking a picture of me. If you enjoyed these photos, be sure to check out some of my latest favorites from January of 2019! Also, please consider subscribing below to receive periodic updates with stories and photos from my life. Sign up to receive occasional emails with my latest photos and stories.